Since I published my first book about OPCs in 1993, OPC in Practice, the term “OPC” has become practically meaningless in the world of food supplements. When you go out to buy “OPCs” or “OPC,” you are entering a minefield. Every step you make can detonate a mine bursting with lies, fallacies and nonsense. Buying unspecified “OPC” may leave you empty handed. In the early 1990s, when I wrote OPC in Practice, there were no OPC-products other than the products containing the OPCs developed by professor Jack Masquelier. These OPCs, very specific and well defined preparations made from the seeds of the Grapevine and the bark of the French Maritime Pine, were produced by companies that worked under license of various patents owned by Masquelier and his colleagues. In the case of pine bark extract, this particular botanical preparation was supplied exclusively by the French company co-owned by Masquelier. There was no OPC on the market other than the OPC developed by Masquelier. This was the OPC that was the subject of the book and the documentary OPC in Practice. Manufacturers “borrow science” concerning product-specific health benefits from manufacturers who market the researched products, for the purpose of associating the science with unresearched, unspecified, undefined or misdefined ingredients and finished products. The practice is misleading and so is the term “borrowing,” because the “borrowing” always takes place without the consent of the manufacturer from whom the product-specific scientific research is stolen. Showing off other people’s feathers, is the more appropriate terminology. When companies use the term “OPC” in their communication, this opens the door to “borrowing” the scientific results obtained with Masquelier’s OPCs, even though the borrowers’ “OPC” may have little or nothing to do with Masquelier’s. Some even go as far as using Masquelier’s patronym in communication that, other than suggesting a relationship between their “OPCs” and the French professor, leaves the “OPCs” products undefined and unqualified. This is how you are being exposed to misleading information and misinformation. When I met Masquelier in 1990, we did consider that after the lapsing of his manufacturing patents, his OPCs would fall prey to widespread and unabashed adulteration and imitation. We did not foresee that his discoveries, research and development would give rise to a market for “grape seed extracts“ for no other reason than that OPCs can be found in grape seeds. Unless specified, “grape seed extract” is a perfectly meaningless term that hints at nothing more than that someone made some extract from … grape seeds. So, there we were. A Dutchman, who had begun his career in the 1970s as tv-maker, investigative journalist, writer, and who, in the 1980s, as a businessman, had introduced Holland and other European countries to food supplements and the “orthomolecular” approach to health. And, a Frenchman, who had devoted his life and entire scientific career to the development and investigation of oligomeric proanthocyanidins, also known as OPCs. Unfamiliar with the world called “food supplement business,” the professor always wondered why he had to provide explanations, insights and sworn testimonies to defend the intellectual achievements he had never considered in need of protection and defense. Until he passed away in 2009, Masquelier provided me firsthand knowledge based on decades of scientific investigations that he had performed or meticulously supervised. He also transfered to me stacks of original records. Files, publications and handwritten notes concerning the scientific, intellectual, industrial and commercial history of OPCs. He took the time to carefully and patiently explain OPCs’ structure, their health effects and the ways in which they function. And, how his scientific results were often the result of following his intuition. Following my intuition, I knew right away that I was onto something. I had to get to the bottom of OPCs. The information Masquelier turned over to me proved to be crucial in separating facts from fallacies. Since writing is in my blood (my father was a “newspaperman”), I decided to publish the story of Masquelier’s OPCs in the form of a book: OPC in Practice. In 1993, the Italian translation of OPC in Practice (“gli OPC in Pratica”) came out. In 1994, I made a documentary bearing the same title. It contains the only recorded interview with Masquelier. In 1995, a 2nd and 3rd edition of OPC in Practice saw the light of day. More books. In 1997, I wrote A Lifetime Devoted to OPC and Pycnogenols, a book that contains the Scientific Address that Masquelier gave in Baltimore (USA) on 18 October 1996. Then, in 2004, I wrote OPCs, Dr. Jack Masquelier’s Mark on Health, a sequel to OPC in Practice and A Lifetime Devoted to OPC and Pycnogenols. 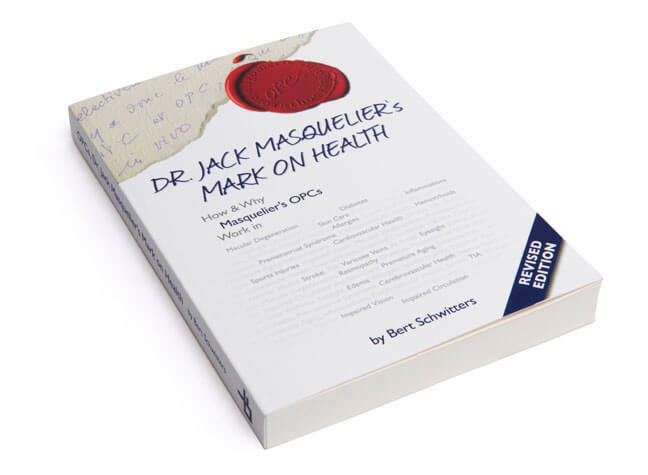 In 2015, I published the fully revised version of this book: OPCs, Dr. Jack Masquelier’s Mark on Health, including the most recent results performed with Masquelier’s OPCs. As the scientific research continues, so will my work to protect Masquelier’s legacy. 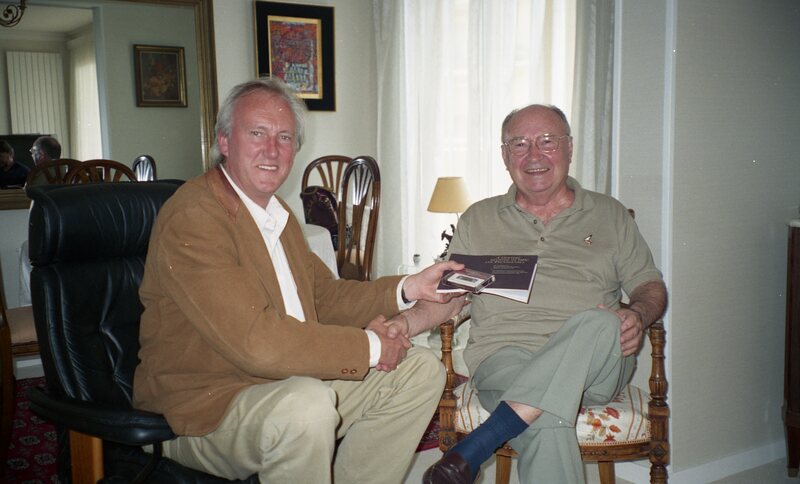 Should you wish to leave the OPCs minefield unscathed and in good health, follow my advice, and read what the friendship between Jack Masquelier and me led to. "Should you wish to leave the OPCs minefield unscathed and in good health, follow my advice, and read what Jack Masquelier and I have to tell you."